...ASK WHAT KIND OF TESTS YOU ARE REQUIRED TO TAKE: most often, you are required to take personality inventories and/or cognitive ability tests. When taking the latter, you should know that there is a time limit in the test and you should give your best when completing the test. When answering a personality inventory, you can take your time and it is your opinion that matters, your choice cannot be 'correct' or 'incorrect'. ...TAKE A LOOK AT THE TESTING ENVIRONMENT: you can take a look at the sample testing instructions that are presented exactly in the same way as before the actual test. Having familiarised yourself with the instructions, you are well prepared for the actual testing process. ...BE WELL-RESTED AND REFRESHED: whenever possible, tests should be taken at a reasonable time, not too early or too late during the day. This is of particular importance in mental ability tests. Have a good rest during the night before testing and enjoy a good breakfast – a well-rested person is better prepared for mental ability tasks. ...TESTING PREMISES: if you take tests in an office, it should provide you with a quiet environment free of disturbances or any other inconvenience. If you take a test at home, make sure that similar conditions are met. ...FEEL FREE TO ASK QUESTIONS: if you have any questions regarding testing, please feel free to contact the person who administers testing. He or she can tell you how much time you will need for tests. Make sure that you understand the testing instructions, and if necessary, ask for more information. This ensures that the test will measure the parameters that it is intended to measure. ...INFORMED CONSENT: before you take a test, you are required to give your consent to storing your test results in the web-based testing system administered by Tripod. The data are used to calculate the results for your test(s) and they will not be accessible to third parties. Unless you submit the electronic consent, you cannot take the tests because it would be impossible to calculate the results. You can submit the consent before the test, after you have entered your personal information. There is a ticked box next to a clause explaining the consent. If, for any reason, you do not wish to take the test and give your consent, please ask the person administering the tests about alternative options. ...SWITCH OFF YOUR MOBILE DEVICES: this is of utmost importance if you take a mental ability test. A call can intervene in the process even if you do not answer it. You will usually need some extra time to focus on the test again. Without the call, you could have used it for the exercises already. A phone call can be an unnecessary distraction also when answering a personality inventory. ...USE YOUR TIME WISELY: make sure that you read the instructions carefully before starting the test. These will help you get a better understanding of what to expect in terms of exercises in cognitive ability tests, for example, which have a time limit for answering. 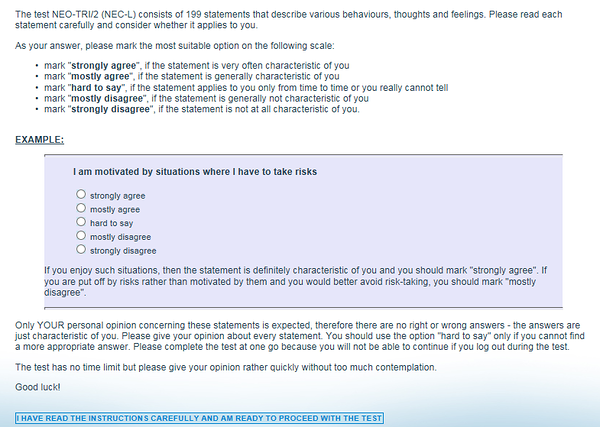 ...ANSWERING QUESTIONS: please go through all the statements in personality inventories. Whenever possible, try not to answer 'hard to say' but choose another option that matches your position. 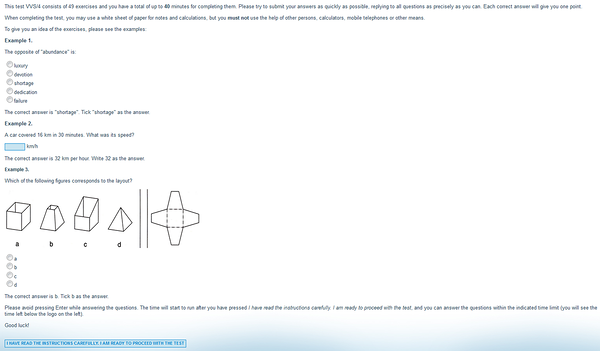 In a cognitive ability test, please complete as many exercises as you can. Some people can answer all the questions within the time limit, some cannot. So if you are unable to complete all the exercises, you need not worry. However, please keep in mind that you are expected to submit as many correct answers as possible. ...USE ONLY AUTHORISED AIDS: please use only the aids listed as authorised ones in the instructions of cognitive ability tests. In a number of tests, you can use a sheet of paper and a pen for making notes, but cannot use a calculator. This also means that you should not use the calculator included in your computer or your mobile phone, as your test results cannot be compared to those of the norm group in such a case. ...YOU HAVE GOT A NEW EXPERIENCE: you know more about the testing process and yourself. A thorough and professional feedback on your test results will help you apply your strengths better in your career or make choices for which you have prerequisites, as well as apply for jobs that require the competences that you have. ...FEEDBACK: each test-taker always has the right to get feedback on his or her results. The administrator of the test must give you a written summary of your test results. This can be forwarded as a file to your e-mail address or printed out for you. Please be aware that you are always welcome to discuss your results with the administrator of the test, either right after you receive them or contact the administrator later on, whenever you have questions. ...DATA PROTECTION: you can be sure that your data are protected as required. The results of the tests provided by Tripod are stored in a server protected by the Thawte SSL certificate, and are accessible only to the administrator to whom you have given your informed consent. The administrator of the test has agreed to use the results for the intended purpose only. This means that they will not be passed on to third parties, unless you give your consent to it separately.